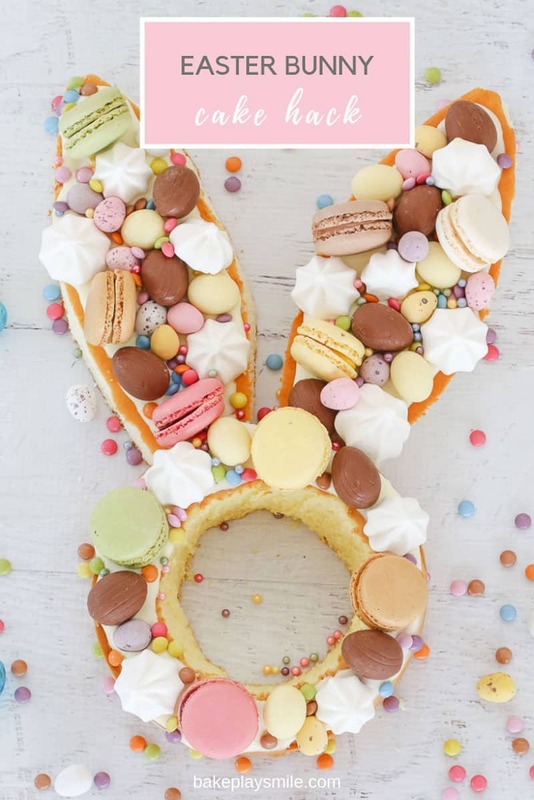 A super cute Easter bunny cake hack made from store-bought unfilled sponge cakes, frosting, macarons, Easter eggs, mini meringues & more! 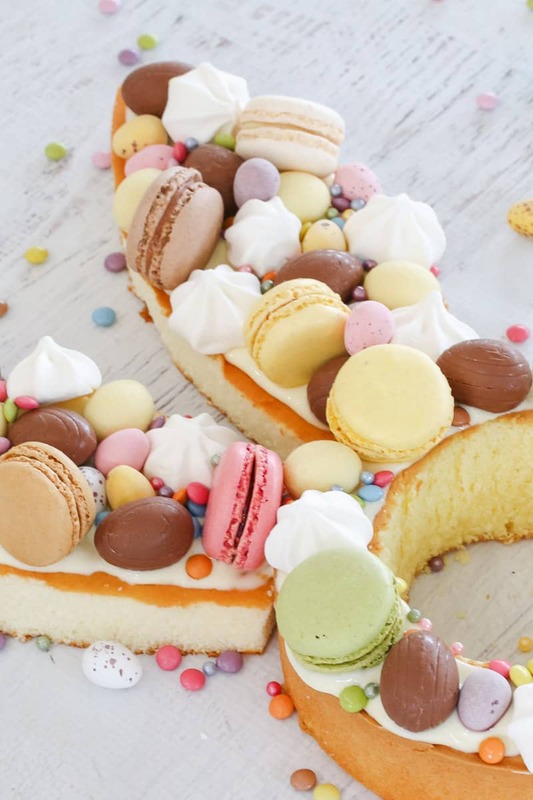 I absolutely love, love, LOVE a cake hack! If you’re not familiar with the term, it’s basically where you take a few shortcuts to make a gorgeous looking cake. 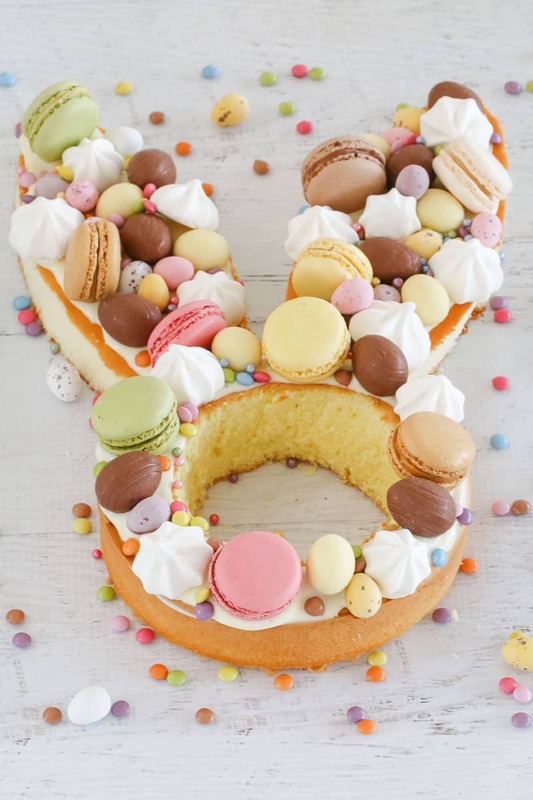 In this cake hack, we use store-bought unfilled sponge cakes to create the outline of an Easter bunny face and ears. 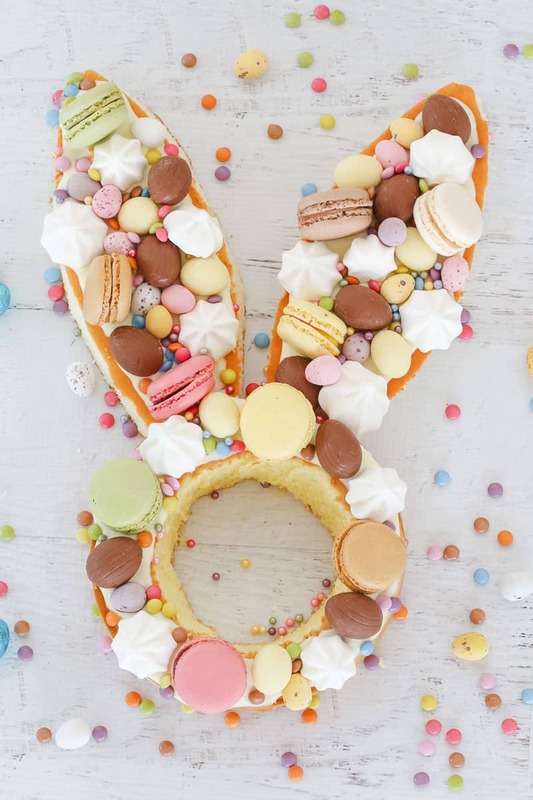 It’s so simple… and is a total Easter showstopper. 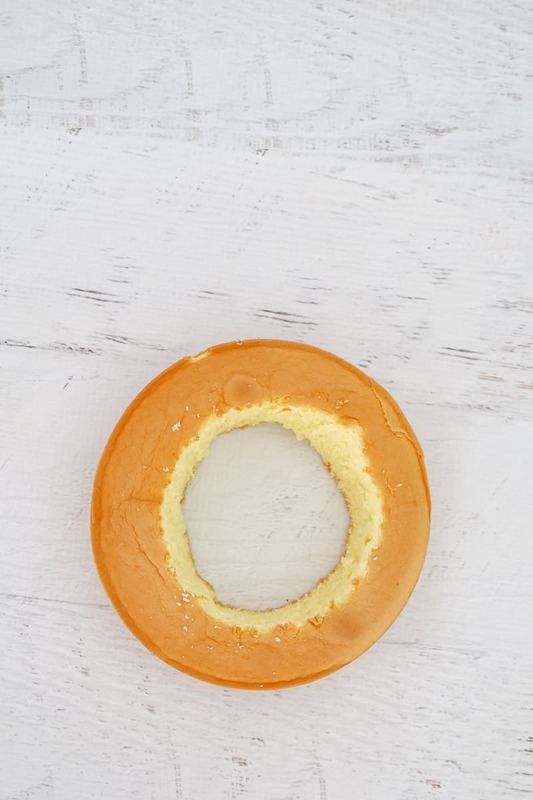 Step 1 – Cut a circle out of the middle of a round unfilled sponge cake. You can use any brand of sponge cake you like. This one was bought from Woolworths in the bakery aisle. 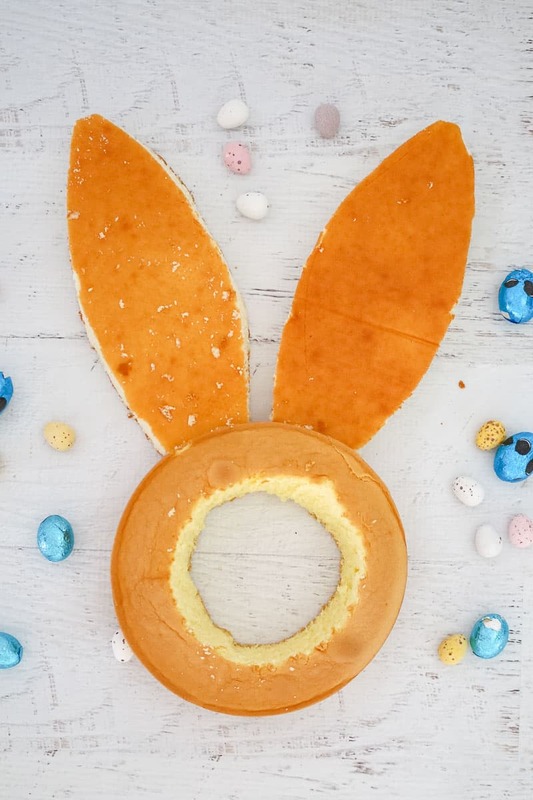 If you’re super clever, you can use a knife and cut the bunny ears out free hand. But if you’re like me, you might want to draw them onto a piece of paper, cut them out and use them as a template on your sponge. If you’re not keen on drawing the ears yourself, you can always Google a bunny ears outline and print it out. You can use absolutely any type of frosting you like. You can make your own or use a store-bought tub of frosting. 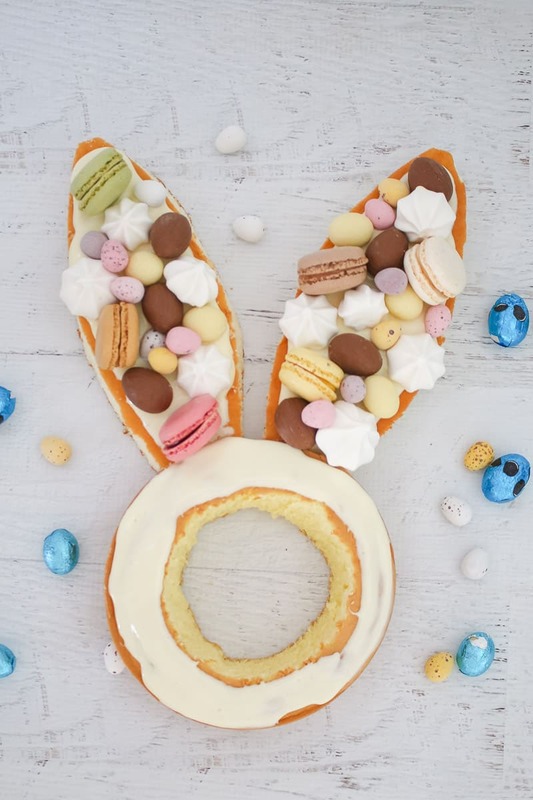 The idea of this cake hack is to decorate the Easter bunny in a pretty pastel Easter theme. You can mix it up with some fresh flowers or fresh berries if you like! This cake (like all sponge cakes) is best eaten on the day of serving… and given it only takes 20 minutes to make, usually you’ll be able to do just that! But if you do need to make it the day before, store it in an airtight container in the fridge and then allow to come to room temperature before serving. 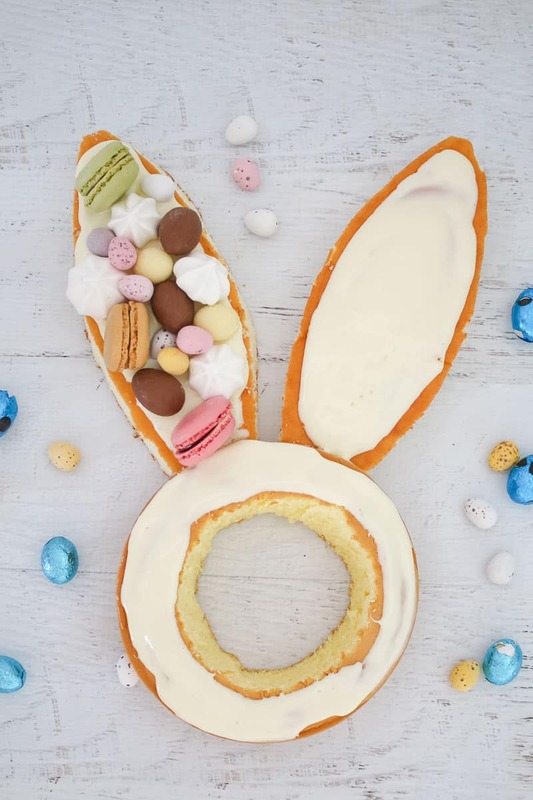 It’s just the cutest little Easter cake right?? And the best part is that it is SO, SO simple! Place the rectangular sponge on a flat board. Cut out two large bunny ear shapes and set aside (see notes). Place a small round bowl or ramekin in the centre of the round sponge cake and use a sharp knife to cut a circle out. 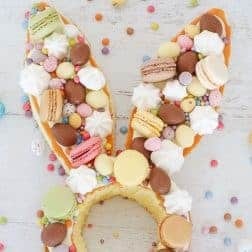 On a large serving board, arrange the round sponge and the two ears into a bunny shape. 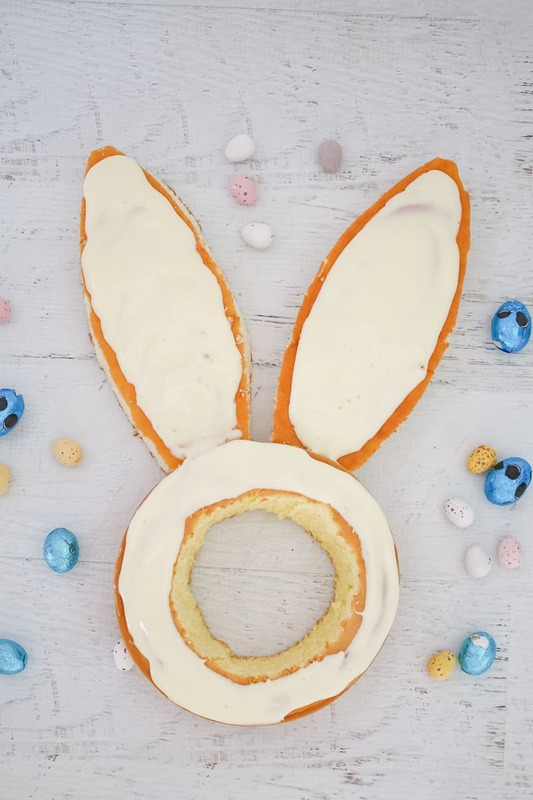 Spread the frosting over the entire top of the bunny. 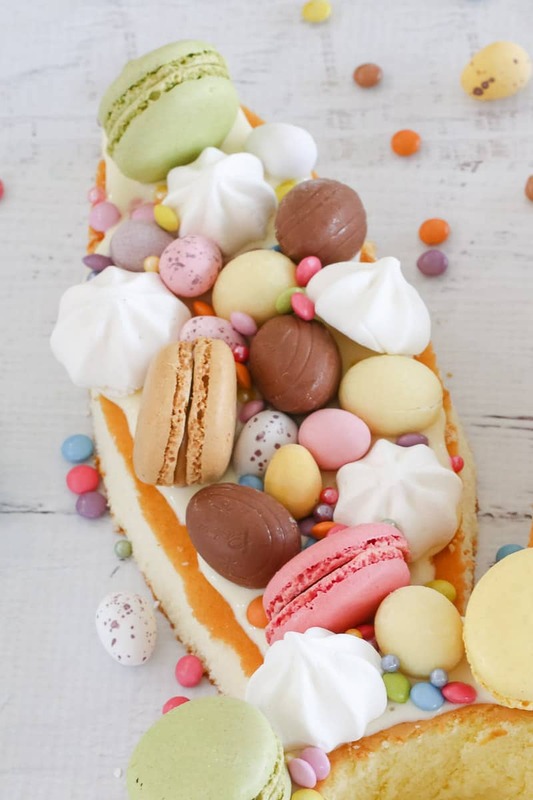 Decorate with mini speckled Easter eggs, macarons, mini meringues, mini white chocolate Easter eggs, chocolate Easter eggs and mini M&Ms. This cake is best served on the same day (see notes). You can use absolutely any type of thick frosting you like. I've made this using homemade cream cheese frosting, store-bought 'Betty Crocker' style frosting... as long as it's thick enough to hold the decorations, it will work perfectly! I traced an outline of bunny ears onto a piece of paper, cut it out and used it as a template for cutting the ear shapes out of the sponge (you could also Google and print a bunny ear outline). This cake is best served on the day. 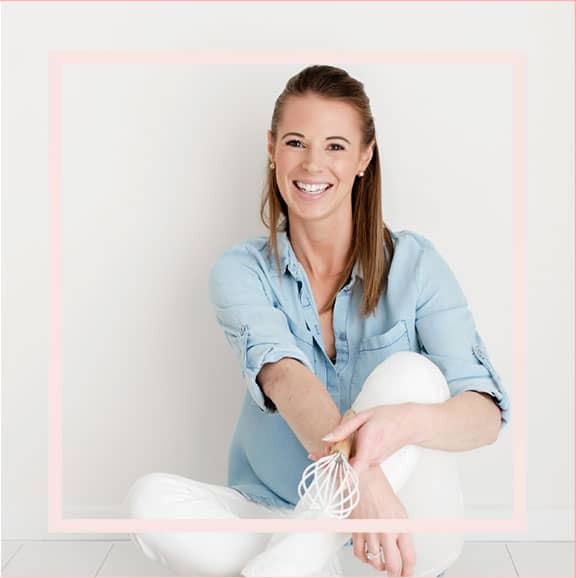 If you need to store it longer, place it in an airtight container in the fridge for up to 2 days (max) and then allow it to come to room temperature before serving.